For those of you who love fall, the best time of the year is right around the corner... when the air starts to feel crisp and, best of all, when you can start adding autumnal touches to your home. So today we're sharing ten gorgeous spaces that embrace fall in a subtle yet effective way. Whether you're excited about it or not, fall is almost upon us and it's time to start thinking about transitioning our outdoor spaces into the new season. So today we're sharing ten great tips for making your patio, deck or porch feel warm and cozy for autumn. I recently lucked into purchasing an old butterfly chair for $20. Twenty dollars! I'm currently in the middle of making it over and was scouring the web for inspiration and found a plethora of gorgeous chairs to buy or DIY! I'm going to attempt the latter. Check out the roundup of diy chair covers for your own inspiration below! 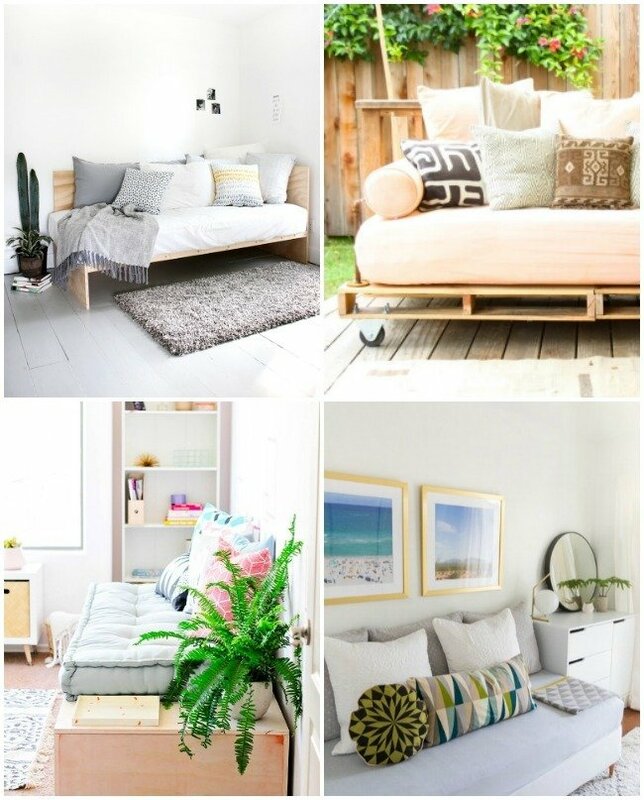 A DIY daybed can be a great way to add some comfortable lounging space to your home. Check out these great examples. We love having guests over for long weekend visits. And now that we have a guestroom, I throw out the invite to family and friends regularly! Prep your guestroom or patio with one of these gorgeous daybeds that are either made from scratch or just include simple and cheap updates! As we transition into the autumn season, I'm taking a look at my own outdoor patio and thinking of little updates that could be made. When thinking of fall, the rustic look automatically comes to mind so I've rounded up a handful of stylish rustic outdoor decorations! The goal of a Scandinavian interior is to achieve maximum style with a minimalist approach. Style, form, function, and simplicity are top priorities in these interiors yet they can still feel extremely cozy. If you have a love for Scandinavian design you will love this roundup of stylish Scandinavian kitchens. Southwest-inspired spaces are full of patterns, textures, and natural elements. My favorite part of this style is how each space is layered, cozy and colorful. Here are ten amazing Southwest-inspired living rooms I just couldn't wait to share with you. Today we're celebrating the simplicity of Scandinavian décor, with its neutral tones and beautiful textures. So if you're a fan of unique, monochromatic spaces, keep reading to check out ten of our favorite Scandinavian style living rooms. Paper goods are my weakness. I loved getting new school supplies each year when I was a child. I sometimes feel like I should have been born a few generations behind me because the school supplies kids get these days?! They're out-of-this-world awesome. Need proof? Check out these 11 notebooks, backpacks, pencil cases, and more! Starting organizational habits now can lead to a happier life later. Trust me on this. You've got to learn to stay tidy while in college so that you home is in order down the road. Here are 15 products and DIY ideas to get the fire burning and keep you interested in cleanliness! If you've got a backyard, or even a patio or deck, you deserve to be able to make the most out of it! I feel like I'll go to the grave loving IKEA. Have you taken an online stroll through their online collection? Let's talk about these 10 IKEA outdoor pieces and how awesome they could make your patio or backyard space! It can be easy to pay less attention to your outdoor space... you probably spend less time there than you do in your living room. But it deserves just as much attention as any other room in your house! And you can approach it the same way, by layering textiles and adding decorative accents. So today we're sharing some inspiration to get your creative wheels turning. Here are ten of our favorite eclectic, boho chic outdoor spaces. Palm Springs is a world of a its own. Set against a desert backdrop, the homes and hotels are filled to the brim with bohemian, eclectic, and midcentury modern inspiration. If you're decorating your patio (or just feel the need to drool over some gorgeous images), here are 9 pretty fantastic spots found around Palm Springs! The southwestern trend has gained traction over the last few months, and now it's going strong - in every room from the nursery to the living room to the bedroom. Keep reading to check out ten of our favorite spaces with a bit of that southwestern flair. When people used to think "Industrial", the words "cold", "unlived in", and "stark" came to mind. That isn't the case today. One can live in a cool and modern way while rocking a bit of the Industrial look. I call it "Industrially Chic" and here are 10 bedrooms that pull it off so well! Eye Candy: 12 Brilliant Craft Room Organization and Storage Ideas! Eye Candy: 10 Big Impact Small Bath Makeovers!